The Herbst appliance, usually in conjunction with braces, is used to help the lower jaw develop in a forward direction. This eventually leads to an ideal bite. Left untreated, an improper bite may threaten the long-term health of your child’s teeth, gums, and jaw. A Herbst appliance is fixed to your son or daughter’s molars. It includes a metal tube that connects the upper and lower jaw. By adjusting the tube, Dr. Frial is able to control the jaw’s position in relation to the upper teeth. Typical treatment time with a Herbst appliance is 12 months, though this may vary depending on your child’s unique needs. 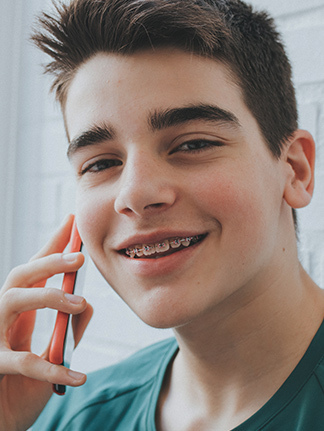 The main difference between a Herbst appliance and headgear is that the former is securely fastened to your child’s teeth, while headgear is removable. To be truly effective, headgear must be worn between 12 and 16 hours per day, which often poses a problem for patients who don’t like to keep it on that long. Since the Herbst appliance is not removable, you won’t need to keep track of how many hours per day your little one wears it. Tissue Irritation – Because the Herbst appliance is metal, it may cause some slight tissue irritation, especially on the lower gums. It will take time for your son or daughter’s mouth to adapt. Until it does, dental wax can help to ease the irritation.